The LVT(A)(1) is an American reserve light tank with a battle rating of 1.0. It was introduced in Update 1.59 "Flaming Arrows". Featuring a crew of six people with a 37 mm gun, it has a rather competitive armament for the size and battle rating. 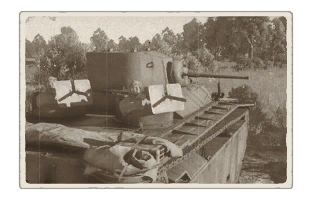 It is also the second amphibious ground vehicle to be added into the game. 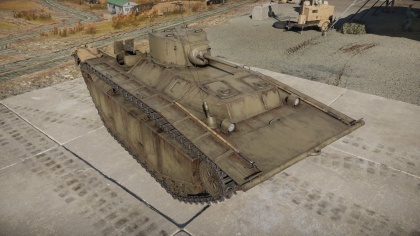 The LVT is unique among the Rank 1 vehicles, given it's ability to float across deep water. It has extremely thin armour that can easily be penetrated by heavy machine guns. In some areas even a light machine gun can penetrate it. It mounts a lightened Stuart turret, giving a decently fast firing 37mm cannon. Additionally, despite its rather large size (relative to it's peers) it is quite mobile due to its light weight, able to keep pace with the M3 Lee. Front hull has flat armour area where driver & co-driver sits. The deadliest threats are HMG and autocannon mounted vehicles such as the Pz. II's, T-60, and AA guns. They can quickly chew through all of the crew. Ammo racks of the LVT(A)(1). Use the LVT(A)(1)'s ability to sneak up waterways to work around the enemy lines, and ambush when possible. If that is not a option, come at them head on, either taking their vehicle out or disabling it long enough to get around and finish it with a side shot. Once done, do not take the waterways back as the LVT(A)(1) is much faster on land. This tank has the capability to work as an early assault tank, not as fast as the Stuarts, BTs and other light tanks. Another tactic that can be done against lightly armoured vehicles is to drive backwards towards the enemy. The combined firepower of 3 machine guns and the cannon increases the chance of take out the enemy before they can take out the LVT(A)(1). The big thing to keep in mind is that the LVT(A)(1) is big. It is a large target that is hard to hide, but the spacious interior makes it harder for enemies to take out all of the crew members. At the same time, keep in mind that the LVT(A)(1) is an easy target for aircraft, as the vehicle presents as very easy target for anything .50 cal and up. Very fast and maneuverable on most terrain. Fast-firing and accurate 37 mm gun . Crew members are spread out, less likely to get knocked out in one shot. Great gun depression at the side and front. 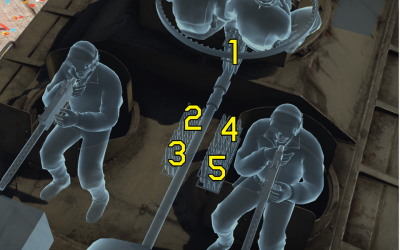 2 machine gunners that can fire at high angles, enabling anti air. Small engine makes it hard to hit. Reserve tank (no repair fees). Amphibious (the first reserve floating tank). Most of the interior is empty space meaning that most tanks will need a few shots to knock out this tank. Barely any armour to speak about. Weak armour and huge size makes it vulnerable to artillery. Bad suspension makes it unstable at humps. Very slow speed when traveling in water. Water rocks the tank when moving, making it unstable during and a while after movement in the water. The vehicle's origins is from a swamp-access vehicle called the Alligator made for civilians. Donald Roebling, its developer, built an improved version of his vehicle with better speed in water. The United States Marine Corps became interested in this amphibious design as they began drawing up their amphibious warfare doctrine. They requested a more sea-worthy version of the vehicle for use in their military operations. Though Roebling and the Navy were reclusive on that idea (the Navy believes they have the current vehicle in store already), the idea brought fruit when World War II broke out in Europe and Roebling created a military version. After a few trials with improvements like a stronger engine, the Bureau of Ships placed a contract for 100 of these vehicles with all-steel armour. The first ones arrive in July 1941, with 200 more ordered before the initial contract was finished. The vehicle design was adopted and designated the LVT, with many different variants of the vehicle being produced throughout the war. The first version of the LVT, the LVT-1, could carry 18 men or 4,500 pounds of equipment. The Marines first used the LVT-1 in Guadalcanal with 128 available to 1st Marine Division. Usage in the field revealed that the LVT was too thinly armoured for a rapid deployment back and forth the ships and landing site, but the Marines saw the vehicle's potential as an assault vehicle. So in June 1941, the Marines push forward with a Roebling design of the LVT armed with a gun turret. In order for this to be possible, the LVT underwent a redesign into the LVT-2 "Buffalo", which had a new powertrain and suspension to allow better performances on land and able to carry up to 6,950 pounds in equipment. It was this design that the turret-equipped LVT's were created. The LVT-2's were armed with turrets from the Stuart series and M8 howitzer motor carriages. These two turret variants are designated LVT(A)-1 and LVT(A)-4 respectively. The (A) standing for armoured as the LVT was built with additional armour to withstand small arms fire. 510 of the LVT(A)-1 were created while 1,890 of the LVT(A)-4 were created. Other variants of the LVT were produced featuring redesigns for its purpose of infantry fire support and cargo-bearing. Some of the significant ones was the LVT-4 in August 1943 that moved the engine forward and had a rear ramp door, which increased capacity from 18 soldiers to 30, making previous load-carrying LVT's obsolete. The LVT-4 was the most numerous of the LVT variants at 8,351 units. The first usage of the LVT family is as a cargo carrier in Guadalcanal, it was unarmoured at the time and only had machine guns as their main armaments. Their next usage was in Tarawa, which saw the first usage of the newly designed LVT-2. The vehicles in both cases carried ammunition, troops, and wounded back and forth the ships and the beach. After Tarawa, the LVT inventory increased by the battalion, as well as the appearance of the gun-armed LVT(A)-1 and LVT(A)-4. The LVT family continued to see service in Bougainville, the Marshall Islands, Saipan, Peleliu, Leyte (its largest usage in the war), Iwo Jima, and Okinawa. The LVT's also saw use in South East Asia in use by the British, but they never saw combat action. Outside the Pacific, the LVT also saw use in the European Theater of Operations. Their first usage was in North Africa in November 1942 during Operation Torch to land troops, where its best usage was to get stranded landing boats back into action. The LVT's were also given to the British as part of Lend-Lease. The LVT's were used in the Normandy landings and other operations in Europe such as crossing the Rhine River in Germany and Po River in Italy. After World War II, the LVT's continued to see action in the multiple conflicts in the world. A number were given to the Chinese Nationalists in the Chinese Civil War by America. Many of these were captured by the Chinese PLA, with some converted to use a 75 mm howitzer or a ZIS-2 anti-tank gun. The Americans used a number of LVT vehicles in the Korean War, notably the landing at Inchon and the attack on Seoul. The French also used American-supplied LVTs during the Indochina War and the Suez Crisis.